According to its leaders, the American people doesn’t really exist. There’s something called the United States, a landmass filled with citizens (and uniformly virtuous immigrants) who are hard-working and industrious. This geographic entity is “exceptional” and uniquely blessed by God, as are its swelling numbers of random inhabitants. But there’s no nation. Instead, there’s a collection of individuals, all “free,” united only by certain “principles” and “ideals.” And our leaders always say our best days are still before us. Thus, American politics isn’t about securing our interests as a people or a nation. Instead, it is an endless argument about the American Creed, the slogans handed down to us from our founding about freedom and liberty and all men being equal. The Right and Left will emphasize one slogan or the other, but the vocabulary is always the same. And somehow, the more high-minded and abstract the rhetoric, the more comfortably it serves the interests of those who already hold power. Of course, the historic American nation, the white American core of the polity, keeps the System creaking along, even as this indispensable ethnic group is dispossessed and deconstructed by its own government. But now, there’s a palpable sense the whole thing is breaking down. Income inequality has all but destroyed social mobility, and the middle class is collapsing. Radical social movements undermined traditional values. Ethnic tensions destroyed social trust as the founding population has been gradually pushed aside in the country it created. And basic responsibilities of the state such as the maintenance of infrastructure, border security, and even the administration of justice, are starting to collapse even as the government struggles to hold together a far-flung military empire. In short, in terms of where we are in the historical development cycle, America is about due for a Caesar. But because this is America, Caesar may arrive in the form of a reality TV star. Donald Trump promises to Make America Great Again. His appeal, which Peter Brimelow described as “kingly,” is revolutionary. It is revolutionary precisely because it dispenses with the usual American Revolutionary rhetoric. What Donald Trump says could apply to any country. Behind the rhetoric and bravura, the heart of Trump’s case is that the United States is being exploited by crafty foreigners and let down by stupid leaders. Our soldiers are used as pawns in overseas military adventures that don’t serve our interests. Our workers are being crushed by catastrophic trade agreements. Our future is being given away to immigrants who are taking our country right out from under us. “We have to stop being the stupid country,” Trump always says. This appeal could be made by any other charismatic leader of any other country. Rather than saying America is “exceptional,” Trump is saying we are a country like any other, one losing the global competition for power and wealth. There’s nothing inherent about America that makes it “great”—it takes decisive action and bold leadership to defeat our enemies and restore our power. Trump makes many conservatives uncomfortable because implicit in his approach is the idea that it’s possible for America to lose. It’s possible if he’s not the leader anyway. Trump promises a strong and great country we will all be “so proud” to be a part of. “I want to do something very special,” he says, as if being the most powerful man in the world will be a sacrifice for him. This will include bringing back the “dignity” of the Office itself. He writes in Crippled America: “The president is the spokesperson for democracy and liberty. Isn’t it time we brought back the pomp and circumstance, and the sense of awe for that office that we all once held?” Trump is offering himself not just as a problem solver, but as a kind of constitutional monarch and a unifying figure . But, contra the claims of some of the more excitable elements of Conservatism Inc., Trump’s imperial style doesn’t make him a dictator. He’s promised to work with Democratic leaders and cut deals. For this, he’s been attacked by the same conservatives who call him a tyrant in waiting in the next breath. In his own way, Trump is trying to build a national policy consensus. He says he will provide health care to the poorest among us, which conservatives turned into an accusation of supporting  “Obamacare.” Unlike many conservatives, Trump has argued against raising the retirement age on Social Security and has no patience for slashing those programs which actually benefit his own supporters. Trump’s foreign policy promises an unsentimental defense of our own national interest, rather than the crusading idealism of George W. Bush. When it comes to political correctness, immigration, guns, and taxes, Trump outdoes just about any “movement conservative,” but when it comes to spending, he’s a moderate who believes in some form of a common good, rather than Margaret Thatcher’s sneer that “there is no such thing as society.” Rather than that of Ronald Reagan, Trump’s conservatism is that of Bismarck. Interestingly, Trump is appealing to people as Americans—black, white, Hispanic, men, and women. He’s using identity politics, but pro-American identity politics, something almost unheard of. He speaks in terms of our collective interest and distinguishes it from the interests of foreigners, whose interests he regards as irrelevant. When confronted by Left-wing protesters, Trump shakes his head sadly, wondering aloud about those misguided souls who don’t want America to be strong and great. Trump is a “citizenist ” who views Americans as an organic community to be privileged and protected by “their” government against the Ausländer to whom we owe nothing. And we can trust Trump, it’s implied, because his massive ego is now identified with that of the nation itself. “My whole life is about winning, and now I want to do that for America,” he says. What’s amazing is not how well this is working, but how much trouble he’s having. American conservatives have turned on him with savage fury. Their incoherent critique against him largely hinges on Trump’s supposed refusal  to mouth the usual pieties about “the Constitution” and “freedom” which the Beltway Right doesn’t even believe. Trump’s tax plan alone shows he is hardly some populist demagogue. While conservatives downplay existential issues like immigration, we are told Trump must be rejected because of his support for ethanol subsidies and eminent domain, both of which will remain in place regardless of who is elected to the Oval Office. It’s also striking how many conservatives have openly said they would rather lose than have him be the nominee. A key talking point of the emerging Alt Right is that the American conservative movement has failed to “conserve” anything important throughout its history, including traditional values, limited government, and the country itself. Not only is America not a “Center-Right nation,” its “Right-wing” political tradition seems indifferent to the nation itself. Trump’s leading primary challengers, Marco Rubio and Ted Cruz, are not even American in terms of heritage or mindset. Cruz was not born in the country, and for all his recitations of the Constitution, may not even be eligible to be President. To Cruz, the country is simply the subject of a laboratory experiment for his abstract creed of “limited government.” Cruz’s strange combination of Third World Catholicism and degenerate American evangelism means this Princeton-Harvard lawyer backed by Wall Street money LARPs as a kind of 21st-century Billy Sunday. His crazed father tells the rubes his son is an “anointed king” who will return the nation to God. But Ted seems to have no particular interest in the country he’s adopted, viewing it merely as a vehicle for his own ambitions. And his own wife is part of a movement  to abolish the country altogether. While Cruz is indifferent, Rubio is actively hostile to the country’s core population. He’s assisted  major corporations, especially Disney, in replacing his own constituents. He betrayed  the conservatives who put him into the office almost moments after winning his election. He’s gleeful about plunging the country into another disastrous war in the Middle East, this time against Russia. Rubio represents the return of George W. Bush-style neoconservatism, now with a white Cuban faux “Latino” as the Shabbos goy instead of a faux evangelical cowboy. As with Lindsey Graham, one can’t help but suspect “they” have something on him. Jeb Bush is still in contention, but even a picture of him is self-discrediting. He’s simply a caricature of WASP decadence given life. Conservatives know that neither Cruz nor Rubio would actually do much in office. As Cruz’s supporters  in Iowa said, they wanted someone who “shares their values.” They take the hostility of every person he’s ever worked with as proof that he’s “principled.” Rubio’s supporters, especially the consultants, seem to believe he can “win,” and what he does after that is essentially irrelevant. Yet what could a President Trump really do? In the unlikely scenario Trump wins, we’ll paper over the hole where our national soul should be with big projects designed to conceal the decline. True, the Great Wall of Trump would be a glorious symbol  of our national will to survive. Unfortunately, unless we repatriate post-1965 non-white immigrants, legal and illegal, the demographic damage is already done. One positive effect is the conservative movement would be reconstituted along nationalist lines. But, without confronting demographic issues directly, there would be almost no way to reverse the underlying causes of American decline. Trump himself has said he would not challenge anti-white racial preferences and, aside from immigration, would leave the multicultural spoils system essentially untouched. While Trump has undoubtedly fueled the rise of the Alt Right, in office, he might function as a safety valve rather than an accelerant. Like Putin, Trump would impose a vaguely conservative, patriotic veneer on a state with crumbling ethnic foundations. It’s not that Trump is “pro-white”; it’s that he’s not anti-white, which makes him far Right in the current political context. The best that can be said about him is that we don’t fully know what he’d do, meaning that unlike literally every other candidate, there’s at least a chance he won’t try make our lives worse. Besides, as every Alt Right supporter of Trump knows, it’s not necessarily what the would-be Emperor himself would do, it’s what he would lead to—a legitimate, nationalist American Right. Naturally, American nationalism is far more appealing to European Americans than White Nationalism. “Whiteness” is a foreign idea to many whites. But we are now in a position where whites are being forcibly enrolled in what is a state church with no salvation. To be white is to be racist, full stop. Granted, many whites (like Elizabeth Warren, for example) will simply stop calling themselves white and suddenly rediscover whatever miniscule non-white heritage they have. Many Hispanics who would have been considered “white” in years past now aggressively demand their membership as part of an “oppressed” group, and other “minorities” are eager to follow suit. Even Asians say they’re oppressed now. But there still need to be some white men left to pay the bills. And as we see with the attempted cleansing  of Haitians from the Dominican Republic recently, even when there are no “whites” left, racial tensions don’t go away. The good news is that the System has to force white identity on white Americans, even if they resist it. Concepts like “white privilege” don’t work otherwise. The bad news is that the increasingly overt anti-white hysteria is likely to dramatically increase in the years ahead. Trump reveals, as a Maoist would say, the contradictions within the System. Trump dismisses the propaganda that America is somehow an exception to the laws of history. For America to “win and win and win” as he promises, it requires a nationalist approach in which our government aggressively privileges our own citizens over foreigners. But that mostly means white people. The dominant ideology of egalitarianism requires that not only should white people not be protected by our government, they should be punished. At the same time, the American government relies on the very same white people it is so eager to dispossess for its terrifying economic and military power. Trump reconciles the contradiction. He invites all Americans to participate in his quest to make the country “great.” But because America itself is built on an egalitarian lie and denies the ethnic basis for its own concrete existence, a Trump regime can only delay the inevitable. It might even hasten it, as the anti-white identity politics of the Left will be accelerated under a Trump presidency, as the universities and liberal city governments will practically be in outright rebellion. Both the American creed of universal classical liberalism and Trump’s civic nationalism rely on a white majority. Without explicit white identity politics to safeguard the core population, American can never be great again, let alone greater than it has ever been, as Trump promises. And who knows? Trump is such a singular actor he might move in that direction. But regardless of what Trump does or does not do, the only future for the American Right is identity politics. In the more likely scenario Trump doesn’t win, it’s the end for conservatism. Even if a Republican candidate won the White House, Rubio, Bush, and probably Cruz would promptly work with the Paul Ryan Congress to pass amnesty, thus ensuring conservatism’s permanent extinction. A populist message of national revival built on an America First approach to trade, immigration, and foreign policy can build a long-term winning coalition and give the USA a longer lease on life. As other observers have noted, Trump has tapped into a powerful nationalist force percolating on the Right for many years. The whole point of the conservative movement is to take this force and funnel it into pointless and defeatist causes. Meanwhile, the concrete interests of the donor class (and the Jewish lobby) are protected. At this point, the Beltway Right is barely bothering to conceal the fact that conservatism is just a scam. The people involved know it is a scam, and the well-meaning lower middle-class goobers babbling about the Constitution are simply functioning as useful idiots. Even more importantly, absent Trump, it’s the end of Americanism. Despite the universalism and claim that there is no “Them”  in American conservatism, only whites really believe in Americanism. As demographics change, there is no longer a market for Americanism beyond Glenn Beck-style hucksterism and deeply cynical neocon appeals for “America” to fight Russia. If a billionaire with a massive media megaphone, a celebrity following cultivated over decades, and direct access to millions of Americans can’t break this quarantine on nationalism, no one can. The Donald is a Trump ex machina, and his movement ends with him. The demographics are such that a project of “nationalist” revival becomes impossible, as well as undesirable, in a matter of years. So where does that leave whites? Today, whites exist as a group in a negative sense. We are a force of privilege and oppression, a malevolent enemy to the larger world. However, we have no objective existence—“whiteness” is an illusion created by capitalism or an oppressive class system. We therefore have no legitimate group interests. In contrast, other groups (including Jews) do have legitimate group interests. They also have an objective biologically determined existence, as shown by the Leftist fury directed at Rachel Dolezal. What People of Color lack is agency. Regardless of their numbers, wealth, or state institutions they control, they cannot be racist or sexist because they “lack power.” Even Jews masquerade as an “oppressed” group. People of color and Jews are devoid of moral responsibility, mascots for enlightened whites to use to atone for their existence. To put it another way, whites are in the position of the Third Estate at the beginning of the French Revolution. What are whites in the American system? Everything, in terms of the core culture, the source of political power, and the fount of political legitimacy (as they created the state). But what are they in the political and social order explicitly? Nothing. What is our job? To make them something. And to do that may require a process akin to the French Revolution. Trump is an opportunity for the System to save itself by giving whites a sense that we still have a place in the system. If Trump goes down, it means whites truly have no stake in the existing political order or any legitimate means of political expression. But even if he wins, it’s only a temporary reprieve for the United States and for European-Americans. Culturally and historically, whites will never surrender their sense of ownership of the United States, whatever regime rules it. But this is simply nostalgia. The foundation of the entire existing political order is the systematic exploitation, dispossession, and eventual eradication of whites. For Beltway “conservatives,” whites are simply raw material to be used for their ideological agenda or cogs in a cheap labor machine. For the Left, whites are the eternal enemy that unites their Coalition of the Fringes in an everlasting crusade of hatred. 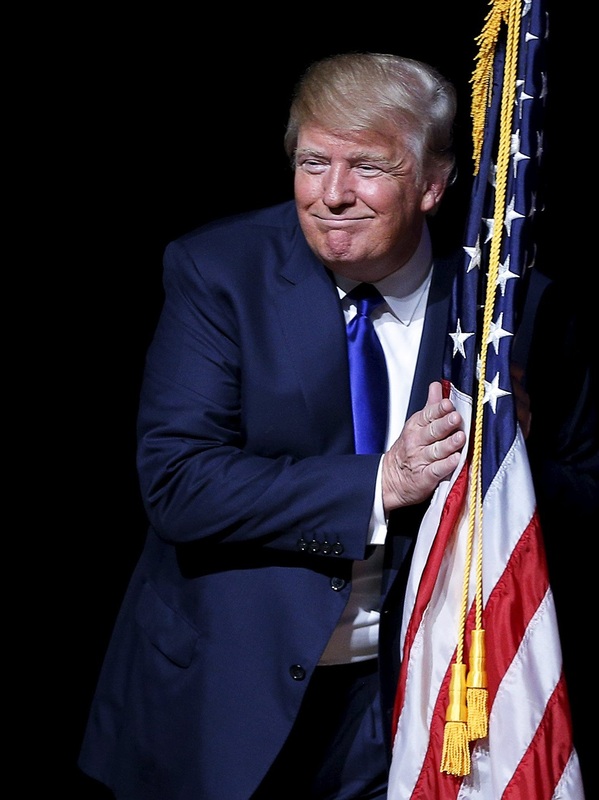 Donald Trump promises  to stop the “assault” on the historic American nation. He’s the last American because he’s the last politician who will ever appeal to the core American population, in the name of the old American order, through the old democratic means. 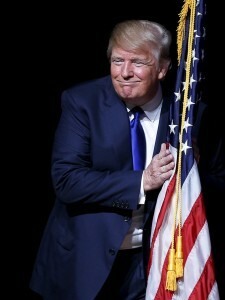 Regardless if he ever wins a single primary, let alone the election, Donald Trump is already a transformational figure. He reveals the System is incapable of saving itself, and European Americans should plan for what comes next.